Norman Mark was a politician with skeletons in his closet. Literally. Disgraced journalist Steven Edwards considers the “Batties” — the loonies who believe that vampires are real and Norman Mark is one — just another crazy tin-foil-hat extremist group. Then someone shoots at Mark, changes into a bat, and flies away before Steve’s eyes, leaving him as the prime suspect. With the help of the Batties, Steve goes underground. The only way he can establish his innocence is by proving vampires exist — not an easy task while on the run from both the FBI and the bloodsuckers. “Tight, funny, well-written, and smart. The attributes of vampires are mostly true to pop culture, and not played for spooky, or all-powerful. The fun part is that while I expected a twist or two, the twists have twists. I was genuinely surprised by several things that happen near and at the end of the book, which rarely happens to me. “I did enjoy the book. He has masterfully taken a lot of very public people who are actual newscasters and other current items, writing them into the yarn. I could see the whole thing unfold as a movie before me as I read. The pacing was very well done and it didn’t drag as the story moved along with Steve and his rescuers. And the twist at the end was not expected, at least not in the names and history that it took advantage of. “Fun premise with a likeable cast of characters. 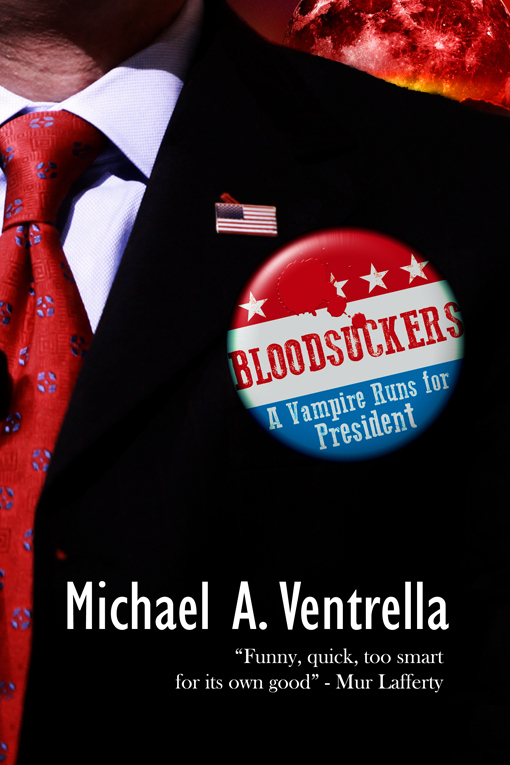 Believe the cover … a vampire really is running for President of the U.S., and there’s only one guy who can stop him: intrepid reporter (read: has-been) Steve Edwards! Problem is, Steve has been framed for attempting to assassinate said vampire. But wait … there’s more! We get to navigate the underbelly of vampire culture and myth, politics, and vampire politics right alongside our hero. And there’s not a sparkle in sight! This book has a lot of humor, cameos from recognizable national political commentators, and a somewhat (but not too) unique take on the vampire myth. There are plenty of twists and turns leading up to an ending that I didn’t expect in the least.